Buying a production boat is an agreeable proposition these days. The designs are proven, the performance options and alternative layouts fully developed, and the suitability of a particular model can be evaluated by simply talking to other owners, going to boat shows, or chartering the boat prior to purchase. If this suggests that we all run around in copycat boats, don&apos;t worry, it just isn&apos;t so. Most current production boat builders offer a selection of options to cater to a wide variety of performance, accommodation, and financial requirements of potential customers. 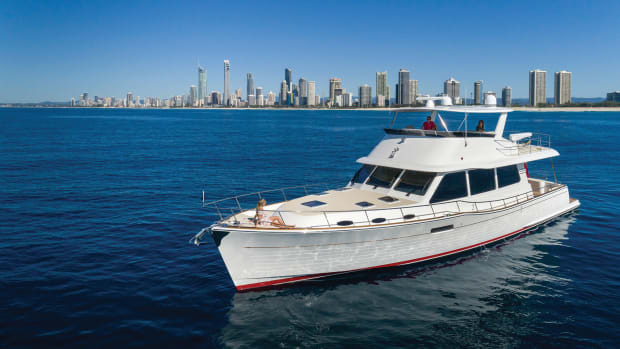 American Marine, builder of the well-known Grand Banks line of trawler yachts, is an excellent example of a leading builder working closely with its customers. The people at Grand Banks present a variety of engine, equipment, layout, and trim packages to allow broad customization possibilities for new boat owners. In fact, they take great pride in accommodating as much of the individuality of the owners as is possible for a production boat builder. The result of such flexibility is that the boats are all similar-and different. Several boats of any given model might be found in a particular boating region, but the tastes and needs of the owners will usually result in variations in the boats that reflect the owners&apos; individuality. This is one reason rendezvous events are so interesting-we get to see how other owners make their own boats special, individual, and in many cases, better. We thought it would be interesting to do an article on such a comparison, but with an interesting twist-two boats of a popular model that have successfully cruised in markedly different cruising areas. Boats cruised by seasoned owners who know what works to make boating safe, enjoyable, and full of adventure. PMM visited two boats of the popular Grand Banks 42 Classic model, and looked at them side-by-side. The added twist of the different geography made it even more interesting, especially for those of us wanting to cruise outside our home territory. So here we go! Let&apos;s look at two GB42 Classics-one with extensive experience in the Puget Sound, British Columbia, and the San Juan Islands. The other yacht has successfully cruised up and down the U.S. East Coast, the Bahamas, and Florida&apos;s wonderful coastline-spending significant time in warm weather tropical cruising. We met Jack and Virginia Bartels at their waterfront home in Stuart, Florida, where they keep Felicity at a private dock. Enjoying an active retirement, they balance their lives with cruising, golf, and travel. They have a summer home on Long Island Sound, and manage to spend a lot of quality time aboard their boat on frequent month-long cruises. Jack is a lifelong sailor. He raced and cruised aboard many different sailboats over the years, primarily on Long Island Sound, Nantucket, and Martha&apos;s Vineyard. He has owned several sailboats, his last being an extensively-modified CT-41 ketch. When they planned for retirement in Florida, it became clear that sailing no longer fit their boating plans-at least in Florida. The weather and the intense sun were concerns, and they also wanted comfort, more accommodations, and controllable performance. So they went looking at trawlers. They bought an almost-new Grand Banks 36, and were introduced to a relaxed and comfortable new kind of cruising. The trawler worked well with their active retirement life, which rapidly expanded to include exploring the Bahamas. After two years with the 36-footer, they were ready to step up to a larger boat, so the search began for a suitable next boat. The boat had wide walk-around decks. The GB42 enjoys a solid reputation as a good boat for two people with occasional guests. While the Bartels considered a Grand Banks 46 during their search for a bigger boat, the 42-footer drew less water and they felt would require less maintenance than a 46-footer. Jack wanted twin naturally-aspirated Caterpillar 3208 diesels. Caterpillar 3208 diesels. So they arranged for the sale of their smaller Grand Banks 36, and bought Felicity. Stepping aboard Felicity, you sense the feeling of pride about this boat. The varnish work glistens, the stainless is clean and polished, and the boat bristles with TLC. The Bartels do all the maintenance themselves, and it shows. Jack has 140 feet of 3/8-inch chain for his primary anchor rode, attached to a 45-lb. CQR. To keep track of how much chain he puts out while anchoring, he painted the chain with a recurring series of marks-red at 10 feet, white at 20 feet, blue at 30 feet, red again at 40 feet, white again at 50 feet, and so on... Most anchoring is done in 8&apos;/12&apos; of water, often with a Bahamian moor on a sandy bottom, and Jack puts out 7:1 or 8:1 scope in most conditions. His second anchor is a 44-lb. Bruce, attached to 15 feet of chain and 5/8-inch nylon rode. One of the popular design features of the GB42 is a comfortable flybridge, and it is where Jack spends most of his time while under way. A large bimini keeps sun off the crew, and Jack and Virginia find the flybridge a great place to be while cruising in the tropics. Electronics on the bridge include Furuno 1930 radar, Northstar 800X LORAN/GPS, Cetrek 772 autopilot with remote, Datamarine depthsounder and knotmeter, ICOM 120 VHF radio, and a liquid compass. Jack especially appreciates the round dial design of the autopilot control head, which allows him to reach down and adjust the boat&apos;s course by feel-especially useful when his eyes are focused on lobster or crab pots, or debris in the water he wants to avoid. Much better than having to look down and punch in numbers. Jack mentioned that the Datamarine Offshore Model 3000 depthsounder works fine, but he would recommend a unit with better accuracy and definition in shallow water. Island cruising involves operating in shallow water areas, and it isn&apos;t particularly useful to have the extreme depth range of an offshore depthsounder. It is much better to have a unit that accurately indicates shallow water with higher definition. A teak-framed chart holder (a bit like a flat, opening picture frame) holds a chart firmly in place, easing navigating chores by keeping the chart from blowing wildly around while at cruising speed. While all electronics (except radar) are repeated at the inside steering station, Jack doesn&apos;t find himself using the lower helm position very often- unless the weather is truly miserable. The generous seating capability of the Grand Banks 42 flybridge also houses some large storage lockers, which the Bartels use for storing extra water. Thirty 1-gallon water jugs just fit under the seats, and augment the normal 250 gallons of fresh water tankage. Speaking of water, the Bartels are meticulous about bringing clean, filtered water aboard Felicity, so they put together a hardware store-purchased filtering system. Dockside water first passes through a particle filter, then a carbon filter, before it gets into the tank. The Bartels use this filter setup every time water is brought aboard the boat, even at their home dock in Stuart. They report it works well, and they have had no problems with bad or dirty water on any of their cruises. They carry an assortment of various electrical shorepower plugs, but they have not found a need for a similar assortment of hose fittings for getting water in different cruising locations. The Bartels have covers for all windows, equipment, and major teak trim-a must for leaving a yacht exposed in the tropics. They like doing the maintenance and brightwork aboard Felicity, but not on a weekly basis. Inside Felicity, everything is orderly and neat. There isn&apos;t a lot of "stuff" laying about, or extra equipment installed everywhere. Experience has shown Jack and Virginia what is necessary aboard, and what is fluff. This is a serious cruising boat, yet it doesn&apos;t look much different from any number of other GB42 boats. That certainly says something about the virtues of the Grand Banks design! With few exceptions, the Bartels find the basic layout, finish, and systems aboard the GB42 to match perfectly with the cruising lifestyle they enjoy. Light beige leather upholstery works well for them while out on the water, and is easy to keep clean. The interior appears cool and open, accessorized with simple but tasteful colors and fabrics. When they purchased Felicity, Jack and Virginia immediately replaced the standard electric stove with a Seaward Princess LPG stove. Experience with their GB36 told them that running the genset to cook was too disruptive to their cruising routine, and Virginia prefers gas as a cooking medium anyway. She loves to cook and entertain, so the galley has to be right. The boat has Grunert cold plate refrigeration, and there are separate refrigerator and freezer compartments in the optional L-shaped galley. The genset runs two hours a day to keep things cold, and the system works almost too well. Virginia reports that over time, vegetables and other perishables tend to freeze, and they haven&apos;t come up with an effective way to deal with this inconvenience. Any ideas out there? Since the Bartels sometimes cruise with other boats from their yacht club, Felicity is often a common socializing platform. With creative arranging of available space (the foredeck becomes a temporary cocktail lounge while dinner is being prepared), they have served dinner to fourteen people aboard her-not bad for a 42-foot yacht! Wine is stored under the salon seats, and they have sufficient food storage aboard for their month-long cruises. They do wish fresh foods were more readily available. They have an icemaker aboard, and find it "absolutely necessary" for cruising in the warm climate. To aid ventilation while underway, Jack fitted 6-inch catches on both doors to hold the doors open part way while the boat is moving. This brings welcome ventilation into the salon and lower helm when it is raining, or when there is a lot of spray. While Felicity has air conditioning, the Bartels don&apos;t use it very much-the opening windows and doors allow plenty of fresh air and cooling breeze inside the boat. During our visit with the Bartels, it was very comfortable aboard, even in the hot Florida sunshine-because the Grand Banks has plenty of opening windows, ports, and doors. At anchor in the Bahamas, the Bartels are very pleased with the great ventilation of the Grand Banks. They use a couple of inexpensive 110VAC household fans to aid ventilation when necessary, which is much simpler than a number of little 12VDC fans mounted around the boat. When not in use, the larger fans can be easily stowed out of sight. They only turn on the air conditioning when they find themselves staying in a marina (where there is too much noise at night) or when it is humid or buggy. The aft cabin in Felicity has the normal double berth on one side, single berth on the other side. Between the berths is a desk, which also cleverly houses a clothes dryer. Virginia suggests that if there is only room for a washer or a dryer, definitely go with a clothes dryer. From their experience, doing laundry in the Caribbean can be time consuming and costly, and more than a little inconvenient. She also suspects the dryer temperature settings in island laundromats are purposely turned way down to make drying clothes take forever-and cost more. Since washing clothes is often a case of a simple wash and rinse, having a clothes dryer aboard is tremendously convenient. Towels and bathing suits can be quickly dried after use, so there is less clutter in the head compartments. Speaking of heads, Felicity has two. The toilet in the aft cabin is a modern Vacu-Flush unit, and it has worked out well for them. The forward head compartment has an electric Groco toilet. In case of electrical failure, the Groco can be operated manually, so basic needs can be attended to while the crew is trying to restore electrical power. Felicity&apos;s Holy Place is located directly under the salon floor. The two 3208 Cats visually take up much of the engine room space, but there is room for batteries, the A/C unit, inverter, stabilizer gear, and the genset. Jack reworked the original battery system to better handle their electrical requirements. There are two 8D batteries (one for each engine), a 4D battery for the genset, and two banks of two Exide 2200 golf cart batteries to support the Heart Interface inverter. The inverter supplies 110VAC to the 110VAC outlets around the boat, as well as the icemaker and microwave oven. Jack installed an electric Groco oil change system to assist his maintenance duties. He performs daily checks of fluid levels in the engines and transmissions, and visually checks all hoses and fittings for leaks or wear. The Bartels are a very much a team looking for adventure, and their success is a direct result of their preparations and planning. They research each cruise in detail, and tend not to follow a schedule-preferring to take life as it comes- within reason. As Virginia puts it, life is full of stories and adventures- and there is a tremendous number of exciting things that can happen, and people you can meet-if you are free and open to them. Virginia also discussed their safety rules aboard Felicity. Whenever they cross the Gulf Stream, for example, they wear inflatable lifevests. will know to watch her as she makes her way around the boat up to the flybridge. This is a very good idea, especially when someone is moving around the side decks of a boat balancing a tray of sandwiches and drinks with a short-handed crew of two-and the boat is moving along at cruising speed. They have not found getting diesel fuel to be a problem. Given the great economy and range of this kind of boat, full tanks can take them a long way, and with a little planning, they have not had difficulty obtaining fuel while cruising the Caribbean. Garbage is somewhat more difficult, especially with recycling. The normal routine is to double-bag garbage and store it in the lazarrette until they find a suitable disposal site. Most fuel stops, however, do have responsible garbage disposal facilities. Jack reports that recycling is still manageable, so an environmental awareness can be maintained while cruising-as long as you plan for it. They both mentioned that something right must be happening in our world-the amount of garbage seen floating in the ocean is much reduced from years back. On the issue of holding tanks and marine heads, their experience is that very few pumpout facilities exist off the beaten track. This is not likely to change for some time, so they don&apos;t recommend an onboard marine sanitation device that relies solely on holding tanks. Jack told us how happy he is with the fin stabilizers on Felicity. The Naiad system adds tremendously to the comfort factor while under way, especially in beam seas, and he enjoys watching two boats cruising in company when one is stabilized and the other is not. He would not leave home without them. On navigation issues, Jack has some interesting observations. Cruising in southern waters, especially the Bahamas, doesn&apos;t really require radar, at least not a top-of-the-line unit. They do find radar helpful for maintaining distance off a shoreline, however, as well as centering the boat while entering any "cut" between islands. It can also be used to track rain squalls, although a trawler can&apos;t usually dodge a fast-moving squall-but at least they can see it coming. The Bartels don&apos;t run at night very often. They know their limitations-so they don&apos;t invite trouble by being out with reduced visibility. The charts of the Bahamas aren&apos;t perfect, and many aids to navigation are literally sticks placed in the water to mark shoals, entrances, or submerged rocks. Radar doesn&apos;t help here, and LORAN isn&apos;t reliable in fringe areas like the Bahamas. Jack finds GPS to be an outstanding navigational tool, especially when it is used with good local waypoint information. Experienced cruisers can often supply GPS waypoints of the "stick aids", which can make a big difference in keeping power cruising from being a white-knuckled experience. Again, it gets back to planning and research before you leave. Felicity is a well-equipped cruising boat, yet it didn&apos;t take much effort for the Bartels to make it so. Grand Banks builds a great boat for people who cruise in a style similar to Jack and Virginia Bartels, especially for month-long passagemaking to the Bahamas. They also enjoy playing golf at courses along the way, as well as seeing the sights discovered while researching the trip. They push themselves into new and interesting places, but do so at a pace and level that is safe, comfortable, and immensely satisfying. Ken and Harriet Watters live in the Seattle-area town of Bellevue, WA. Their waterfront home is on Lake Washington, which connects to the Puget Sound via a ship canal and lock system long known to Puget Sound boaters. It is possible to keep a boat at their home dock, but the Watters feel the relatively long transit time of passing through the ship canal and lock is too cumbersome on a regular basis, so they keep 4th of July on the Duwamish River, which offers easy access to the Puget Sound. Ken grew up around the water, and has always had a boat of one type or another. He is also a lifelong SCUBA diver, and has a doctorate degree in Fisheries. He worked as a researcher in the fisheries industry, and spent a lot of time on the water, around the water, and under the water. As far as boats go, Ken has always liked the look and feel of commercial purse seiners, much more so than the sleek lines of many pleasure boats and motoryachts. Harriet grew up in Rhode Island, and loves fishing. Together they spend much time on the water together-fishing, exploring, and socializing with new and old friends. Following his career in the fisheries industry, the Watters got into flying, and Ken spent years as a pilot, flight instructor, and active participant in the local FAA. The Watters have flown all over North America, getting a perspective of America very different than from the helm of a boat. They bought their first Grand Banks in 1987 because it was the first pleasure boat they felt was what a boat should be-heavy, slow, predictable, solid-just like a fishboat. They had this GB for five years, a wood 36-footer with a single Caterpillar diesel. It didn&apos;t have a thruster, stabilizers, or other then-exotic equipment, but they loved the boat. Harriet says they enjoyed being equal partners in bringing the boat up to bristol condition and traveling aboard her. Ken adds that such a boat is "the cheapest and best education possible for learning how to handle a powerboat." The GB36 taught them about engines, systems, and maintenance-and it also taught them not to depend on others for keeping the interior and exterior in shape. Being a wood boat, they learned the care and attention that is required, and they took pride in having people mistakenly identify their boat as a fiberglass boat. They also developed self reliance and confidence in themselves and their boat. Since they bought that first Grand Banks, they&apos;ve successfully cruised the San Juan Islands, the Puget Sound, the waters of British Columbia, and several trips circumnavigating Vancouver Island-together as a team. having found the overall quality and design of the Grand Banks to fit perfectly with their cruising style. The interior layout was similar to their 36-footer, but bigger-the salon significantly bigger. The used GB42 was in good shape, not perfect, but close. They already knew about groundup restoration projects, and they didn&apos;t want to go that route. The boat had two smaller diesels. They would have liked a single, but most 42-foot Classics were built with some form of twin engine installation. The two 120hp Lehmans were an economical alternative to a single, so it suited them just fine. They wanted a fiberglass boat for less maintenance. Even though they enjoyed their wood GB, they were at that point in their lives where less maintenance was a definite plus, so they opted for fiberglass. They had her trucked up to Washington from California, and the route took many back roads- the boat arrived with her bottom covered in cow manure, and tree branches and pine needles all over the topsides. She cleaned up well, however, and Ken and Harriet spent the next seven months bringing her up to their level of finish. 4th of July was commissioned the following spring. aboard all 300 feet of chain from deep water. They feel strongly that an oversized windlass is a must, because fouling your anchor is a real risk in remote areas. They have caught their anchor on all sorts of cable and ex-logging and fishing operation equipment, and a superior windlass makes the difference between successfully taking care of yourself, or being stuck. Their primary anchor is a 45-lb. CQR, with 300 feet of 5/16-inch HT chain. They also carry a 45- lb. Danforth with 300 feet of 3/4-inch nylon as a secondary and stern rode. Ken is allergic to UV, so they never run the boat from the flybridge. The main steering station is inside the main cabin, so there is no bimini top over the flybridge, and no repeated electronics bristling on the flybridge console. In fact, they removed much of the electronics from the flybridge while commissioning 4th of July, and now they have only a depthsounder, VHF radio, autopilot remote, and liquid compass on the flybridge. M57 VHF radio, Datamarine Offshore depthsounder, Garmin GPS-100, Standard Horizon Speed/Log (a piece of equipment they don&apos;t find very useful and would not buy again-no fault of the equipment-it&apos;s just that the GPS info is more relevant), Garmin 200 chart plotter with C-Map cartridges, Furuno 1830 radar (they set it at 3 miles almost all the time), WMS commercial autopilot, KVH fluxgate compass, and liquid compass. They also installed a very loud Buell electric air horn for when they get caught in fog. It is much louder than the standard horn, and it gets used often. While bringing 4th of July up to their level of finish and commissioning, Ken and Harriet&apos;s design philosophy was "We wanted to drop the hook and stay at least 5 days without having to run the main engines." This drove how they set up the major systems aboard the boat. They replaced the electric stove with a propane unit, which is much more user-friendly for an independent cruising boat. To increase the perishable food storage and efficiency, they substantially increased the insulation of the refrigeration compartment, and then built a separate freezer compartment inside a locker in the main salon. A Grunert 110VAC holding plate system supplies the cold to both compartments, and works very well. Ken and Harriet rebuilt the aft cabin of 4th of July to include an island double berth with increased locker storage. (Grand Banks has since offered this option in later production models.) The overhead of the aft cabin was lined with insulation during the aft cabin project, and it greatly improved the livability of the aft cabin. The port hanging locker in the cabin was also modified to fit a swinging cat door at floor level, so Frosty (their cat) can use his litter box without fanfare- the box is on the floor in the hanging locker. Sure beats walking into a litter box at night! 4th of July&apos;s Holy Place is clean and professional looking. Ken insulated the overhead of the engine room compartment (which is the floor of the salon), so engine noise is reduced in the above living area. The twin 120hp Lehmans are relatively narrow, so the engine room doesn&apos;t feel crowded or too busy. Each engine is installed on soft engine mounts, which lessens noise and vibration into the living spaces, and the DriveSaver shaft couplings help eliminate running gear vibration. Ken is rather mechanically and electrically inclined, and it is no surprise to find much of his handiwork in the engine compartment. One of his projects involved building a single point electrical system-every 12VDC device on the boat is attached to a single negative ground terminal and a single hot terminal. The wires are all neatly bundled and identified, so he can ensure clean electrical power to any 12VDC need. The main house service is handled by a single battery bank made up of four L-16 6VDC batteries, providing 700Ah of 12VDC as a single bank. Ken then installed a single 8D for starting either diesel engine, and a single Group 36 battery for the ONAN 7.5kW genset. This three bank system has been very successful for them, and Ken makes sure the system is kept clean and functioning properly. In case of emergency, Ken installed a solenoid that brings all batteries online for starting an engine should there be a problem. Also in the electric system department is a Trace 2500 Inverter/Charger. Each engine has a Balmar 130Ah alternator, and one of the main engines also turns a WINCO 110VAC/35Ah cruising generator. Ken likes electrical systems, and feels charging redundancy is insurance for successful cruising. From the systems installed aboard 4th of July, Ken can keep things going electrically from a variety of charging sources. There is a Grunert water-cooled refrigeration unit easily accessible, as well as an HRO System watermaker that can produce 20 gallons of fresh water per hour. The boat carries 650 gallons of fuel in two tanks, and has the necessary system of filters and valves at hand without gymnastics. The 65-gallon holding tank is also located in the engine compartment, along with the macerator and handling pumps and valves 4th of July doesn&apos;t have stabilizers or a bow thruster. One unique requirement of a Pacific Northwest boat is a heating system, especially if it is run year &apos;round. The heating system on 4th of July is outstanding, and worth a closer look. Forget reverse cycle heat pumps-they don&apos;t work in the cold waters of the Northwest. The system involves a Webasto DW-80 diesel furnace located in the lazarette. The furnace heats water that circulates (via 110VAC pump) through the boat. Integral in the system are finned radiators and air handlers located in each living compartment. The heating circuit also runs through the heat exchangers in both main engines, so the system works off the furnace (while anchored) or the engines (while under way). During the cold weather season, the heating system not only keeps everyone aboard happy and cozy, but keeps the engines warmed and ready to go in an instant. (Starting a warm engine is also much healthier for the engine than when it is cold.) Ken installed a truck block heater in the system to keep the boat from freezing when they are not aboard during the winter. The block heater also acts to preheat the engines for starting in cold weather. Ken and Harriet report the system works great, and provides a high level of comfort for them to cruise all year long-despite cold, snow, or rain. Ken and Harriet spend a lot of time cruising the west coast of Vancouver Island, which is pretty remote. They find no TV reception, no FM radio, and only occasional AM reception. They note that successful cruisers bring their own music and video tapes for just this reason. In many coves, they like to run a stern line to a tree ashore as well-it keeps the boat from swinging, which is the only way you can anchor in some areas. This is accomplished by driving the boat to the shore, physically taking the line ashore, then turning around and anchoring in the normal fashion. Efforts to bring the line ashore via dinghy after setting the primary anchor have usually resulted in the famous "Gee, honey, I fouled the prop again" comedy drama, so they now bring the stern line ashore before setting the CQR. Ken and Harriet don&apos;t run the boat at night-they feel it is too dangerous, with all the logs and wilderness debris floating in the Pacific Northwest. Even in daylight they have run into full grown trees floating just beneath the surface. Deadheads, water-saturated logs that float end up in the water, have long been a problem for faster motoryachts, or twinscrew powerboats with exposed running gear. They use the watermaker to keep their water supply safe and free of germs. In some areas, such as northern British Columbia, giardia has become a hazard in the fresh water systems that supply visiting vessels. They avoid potential problems by making their own water when in remote areas. The Watters report that holding tank pumpout facilities are everywhere in the regular cruising areas, so the use of holding tanks is not a problem. Only in remote areas does it become a concern, but there are more and more facilities each season in these areas as well. It is still important to have provision for overboard discharge, but the Watters find it less and less necessary. attractive-and allows better visibility out the cabin and steering station. Ken and Harriet normally cruise for 6/10 weeks at a time. They find plenty of storage space aboard their Grand Banks, and never lack for space. They don&apos;t find the need for an onboard washer/dryer, perhaps due to the colder climate. They normally do laundry twice during a cruise. benefit of cruising in the Pacific Northwest. They often anchor alone in a cove, shared perhaps with a commercial fishing boat. Sometimes the weather deteriorates and they are stuck for several days. Fun dinner parties customarily ensue with a shared menu supplied from the larder of both boats. Forget the Grey Poupon! Needless to say, they try not to follow a schedule while cruising. They meet fascinating people this way. They recommend installing a good radar reflector, especially when crossing the larger channels and straits. There is a lot of commercial traffic, and having the right of way is an illusion much of the time. Ken normally runs his engines at 1,450rpm, which gives 4th of July fuel consumption in the area of 3GPH-averaging in occasional use of both genset and diesel furnace. 4th of July is an economical boat indeed. Both Ken and Harriet Watters love to travel, and 4th of July provides them with a comfortable home as well as transportation. They have spent a lot of time enjoying their local cruising area, and find their Grand Banks to be just right for them-size, layout, and equipment. With the additional modifications to make her better suited for liveaboard cruising for up to 10 weeks at a time, 4th of July continues to serve the Watters as an able seaworthy vessel that not only looks like a boat should- but is what a boat should be. The comparison of two like boats is a fascinating and entertaining experience, and we thouroughly enjoyed talking, comparing, and poking around both Felicity and 4th of July. These boats have been there, done that-and the owners have accomplished a great deal while cruising aboard these Grand Banks. Making a boat unique to your own style doesn&apos;t necessarily involve making significant or major changes, especially when the boat is a high quality, proven design. 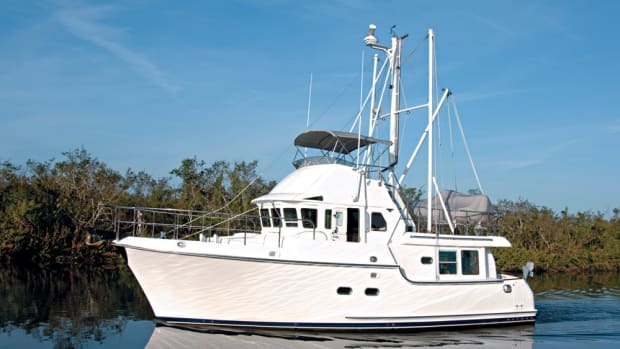 It is interesting to note that the Grand Banks 42 Classic is pretty well at home in areas like the Bahamas, and can be also quite comfortable in colder cruising areas such as the Puget Sound-as long as heating is figured in the commissioning equation. Many of the changes undertaken by the Watters to improve their boat were later standard or optional in the Grand Banks line, which is evidence that American Marine continues to evolve their classic. We hope you enjoyed this two-of-a-kind comparison. It should give positive food for thought, and we expect to do more of these features in the future. For now, however, be content in knowing that, for whatever cruising you intend, it would seem the GB42 Classic can be a pretty good boat for you-right out of the yard. I would like to thank Virginia and Jack Bartels, as well as Harriet and Ken Watters, for sharing their boats and experiences with us. As seasoned cruisers with different interests and geography, these couples embody the cruising lifestyle, each bringing similarities and differences to a common theme- cruising that is comfortable, safe, and attainable. They continue to enjoy life on their terms, and define for us their own measure of adventure. I would also like to thank Ed Roberts and Bob Phillips of Grand Banks, for helping locate these lovely people, and for providing us with boats that are as alike and as different as the Grand Banks 42 Classic. A real pedigree that defines classic.